The College of Science Shaheen 3MT competition began with a big bang on Monday in Jordan Hall of Science. 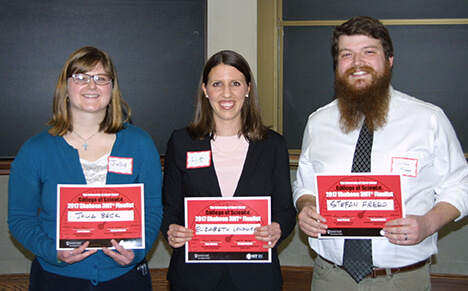 Julia Beck (Biochemistry), Elizabeth Loughran (Integrated Biomedical Sciences), and Stefan Freed (Biological Sciences) took the top three spots, and will go on to compete at the Shaheen 3MT® Final event on March 27 in the Jordan Auditorium in Mendoza College of Business. There they will face six as yet to be crowned College of Engineering and College of Arts and Letters finalists. In addition to the 11 Science competitors, a supportive audience of at least 40 friends and mentors watched the exciting competition. This reporter has it on good authority that even a few of the upcoming engineering competitors were on hand to scout their competition. The evening’s Ph.D. candidate presentations ranged from Clyde Daly’s (Chemistry) work on the direct investigation of climate change through better carbon capture materials to Charles Mueller’s (Physics) study of particle patterns and the origins of mass. Katrina Button-Simons (Biological Sciences) presented on the rates of drug resistant deaths in the world and her work on the repurposing of drugs in combination with drug resistant pathogens to combat this fact. Oyekola Oyekole (Applied Computational Mathematics and Statistics) impressed with his work on the use of mathematical models to more accurately predict the likelihood that a cardio vascular aneurysm may rupture. Kristen Johnson (Chemistry) presented on her research into targeting the ebola virus by way of blocking the transformer protein while Edward Lamere (Physics) addressed the problem of global shortages of Tc-99m with new and more efficient methods of production. Judging the Science Prelims were: Michael Hildreth, Associate Dean for Research and Graduate Education; Rebecca Wingert, Elizabeth and Michael Gallagher Associate Professor, Department of Biological Sciences; Steve Buechler, Professor of Applied and Computational Mathematics and Statistics; and the Graduate School’s own Samantha Lee, the program director for the Office of Grants and Fellowships. And now it’s on to the College of Arts and Letters. qualifying round to be held today from 4 to 6 p.m. in DeBartolo room 214 followed by the College of Engineering final on Thursday, March 2 from 4 to 6 p.m. in Debartolo room 140. 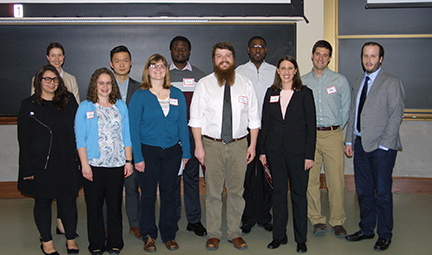 Lisa Michaels, program manager for 3MT Notre Dame, and Graduate Career Services consultant for the College of Science was excited to finally get this year’s competition underway and felt that the students all presented well. “There are so many benefits to participating in this competition whether you’re tenure or career track, the skills required to distill and present your research into a 3 minute pitch will pay dividends for all in the end. Now it’s on to the next qualifier." Originally published by Aaron Bell at graduateschool.nd.edu on February 28, 2017.